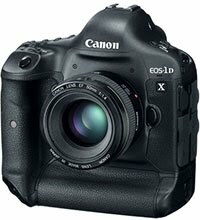 Canon today published a firmware update for its flagship EOS-1D X camera. The function to disable the Image size selection button has been added. Please see the instruction manual "EOS-1D X Firmware Version 1.2.x Additional Function" (PDF file) included in the downloaded firmware 1.2.1 folder for information on how to intentionally disable this button, after the firmware update 1.2.1 has been installed in the camera. Fixes a phenomenon in which Err 70 and Err 80 may occur during certain shooting conditions. Please note that the firmware update takes approximately seven minutes! You can download the firmware update from the Canon website.